1.5kW solar systems were once the most popular system size in Australia. As solar technology prices have come down in recent years, however, most homes are now tending to opt for larger systems – in the 2kW to 5kW range. This article takes a look at the case for installing a 1.5kW solar system in current Australian market conditions. A 1.5kW solar system is pretty much the smallest solar system size that you can have installed professionally. While 1kW solar systems are out there, you will not generally see them advertised by installers because they’re so small as to have a minimal impact on your energy bill. Additionally, our experience is that systems in the 1kW-1.5kW size range offer significantly less value for money than systems even just a little bit bigger. Nonetheless, 1.5kW solar systems may offer superior returns over larger system thanks to the fact that it may be easier for a home to ‘self-consume’ more or all of the energy produced directly. Compare quotes for a range of system sizes: Complete our Solar Quote Comparison request form on the right of this page. How much does a 1.5kW solar system cost? 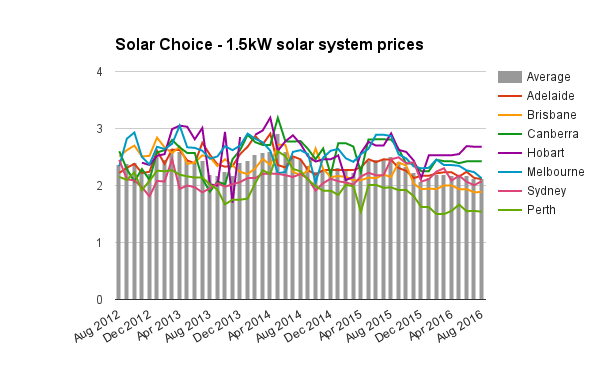 Solar Choice has been keeping track of Australian solar system installation prices since August 2012. During this time, we’ve seen prices for larger systems fall significantly, while 1.5kW system prices have hardly moved (or even increased in some instances). 2kW system prices, on the other hand, have come down by about 20% on average. 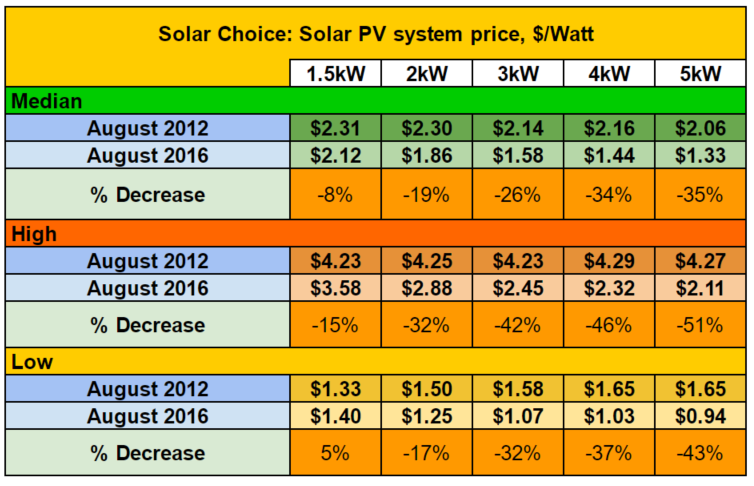 The table below shows the difference between prices for various sizes of solar systems between 2012 and 2016. Prices are shown in dollar-per-watt ($/W) format to make the relative value easy to compare (1kW = 1,000W, so a a 1.5kW system would be 1500W). As of August 2016, according to our data, a 1.5kW system costs anywhere between about $2,100 – $5,700 fully installed (after GST and the federal ‘discount’ on small-scale solar systems). Analysis of how prices of a range of popular solar PV system sizes have changed over the last 4 years. Historic 1.5kW solar system prices by capital city (excluding Darwin). How much energy does a 1.5kW solar system produce? The power output of a 1.5kW solar power system will vary due to a number of factors including, including the local climate, nearby shading, and the tilt and orientation of the panels themselves, among other factors. While it may be convenient and useful to summarise a solar system’s output in a single ‘kilowatt-hours per day’ (kWh/day) figure, the reality is that most locations receive more sunshine in the summer than the winter. What’s the payback period for a 1.5kW solar system? Because 1.5kW solar systems are relatively costly for their size, it’s imperative to use as much of the energy they produce as possible in order to maximise the investment and minimise the payback period. The table below shows payback periods and internal rate of return (IRR) for 1.5 kW solar systems in select capital cities, assuming that they pay 25c per kWh (c/kWh) for electricity from the grid. We’ve assumed that the home in question either uses 70% of the solar energy produced by the system or 100% of the solar energy produced – but please keep in mind that it may require effort (or at least planning or the right technology) on your part to ensure that the self-consumption rate is this high. Keep in mind that the figures in the table below – which are already pretty good – are indicative only and based on median system installation prices; you might be able to improve these numbers by shopping around (we can help). Compare solar installation quotes instantly: Complete our Solar Quote Comparison request form on the right of this page. Hi, I am in Qld and I have a 2kw Sunnyroo inverter and 8 x 190 watt panels on a north facing roof. The system currently generates a max of 1.2 kw/hr. I get the 44c/kWh solar feed-in tariff and don’t use much power during the day. My contract is for a 2 kw inverter. I would like to generate more electricity. I have been told that I can get better modern solar panels to generate more electricity and if I do this I should get a better 2kw inverter. I have also been told that I can generate up to 2.6 kw/hr and the inverter can handle that and it won’t disqualify me for the 44c/kWh solar feed-in tariff. Is that correct and is it advisable? Yes, our understanding is that it is okay to upgrade your panel array but not your inverter under the QLD Solar Bonus Scheme without forfeiting your high feed-in tariff. SMA is the biggest inverter manufacturer in the world and highly reputable. They have an article here about why oversizing your solar array (as you’re proposing to do) can be a good idea in many instances. I would check with a few different companies about their opinions about adding additional panels to your current system, however, as there could be complications related to ‘panel mismatch’. Generally speaking, it’s best to have all the same brand and size of panels in an array. Additionally, with an inverter that size, you’re unlikely to have more than one maximum power point tracker (MPPT) input, which almost certainly rules out an expansion unless you find more of the same (or comparable) solar panels to add on. Hi I just moved into a new house and it came with 1.5 kw pv solar system. There are two boxes on the house one is an on off switch the other larger box has grid connected inverter written on it. When I turn it on the red alarm light is on do I need to add somethingto the system to make it work very confusing. It’s probably worth getting it checked out by an accredited solar installer – there could be an issue with the system. Was there any paperwork or other information left for you about the system? One company that provides solar PV system post-installation services is SolarSafe. You can reach them on 1300 790 790. How much of your solar power that you send into the grid monthly vs how much you ‘self-consume’ depends not only on the size of the system you have, but also the type of metering setup you have (do you have ‘gross metering’ which sends all of your solar into the grid, or ‘net metering’ which sends only what you do not use back?) and how much electricity you use during the day. Assuming you are on a net metering setup, the fact that you sent back 87kWh of solar to the grid in the last period and then 26kWh the next could indicate that either you are consuming more of your solar power during the daylight hours (and therefore have left over to send into the grid) or that your overall solar energy output is decreasing. If you are on a gross metering arrangement, then we can conclude that the amount of power your system is producing may be on the decline and that you should have it checked out. When was the system installed? Hope this helps. Best of luck with your system! hi, i was wondering if you can help me figure out a small dellama i have. what will be needed to run these for an off grid set up? i have asked many people on many websites and i have been disappointed with there lack of response if any. We wrote this article a while back about sizing a battery bank for an off-grid solar system–it might be worth a read. As for the rest of the details–such as the size of the PV array required to power the equipment–I’d recommend getting quotes, either from us (fill out this form) or from an off-grid solar specialist who can customise a system for you. First I need to ask you a few questions too. How much power does one laptop of yours consume ? How much does the fan consume ? Assuming that your laptops consume 100W each, the Xbox consumes 180W and the fan of yours consume 60W (It might not be that much but let’s just say), your total energy consumption throughout a span of 24 hours = 75*12+180*12+100*2*24+60*24 = 9.3 kWh. Now assuming that you get 7 hours of good sunshine everyday, you’ll need a 9.3/7 = 1.328 kW system. So I’d advise you to go for a standard 1.5 kW system. The batteries and inverter would cost you separately. Contact your nearest solar supplier and ask them what the rates of Solar panels are and what their size is to see if you have enough space to add them on top of your vehicle. Solar panels are usually available in 10W to 300W panels and costed as per wattage of the panel you take.